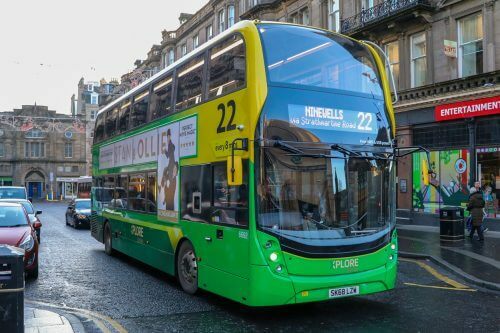 Xplore Dundee has been fined £35,000 after a driver shortage lead to serious disruption to services throughout September, reported the Dundee Evening Telegraph. Appearing at the hearing at Ashton Hall inside the Caird Hall complex were Christine McGlasson, Xplore Managing Director, Managers George King and Frank Scheach, accompanied by Tom Stables, Managing Director of parent company National Express UK. Xplore explained the shortage as the result of unexpected departures from the company and sicknesses, accompanied by holidays taken by bus drivers. Speaking on behalf of Xplore, Andrew Banks told Ms Aitken: “It seems to be the case lately that bus drivers go on holiday later in the year than other people, in late August and September. “You are always going to have a bit of a shortage at that time of year. “What happened here isthat the company was already about 20 drivers short. “In August, one of the people involved in managing the situation left quite suddenly. The Dundee Evening Telegraph also reported that whilst Xplore had hoped for a lighter punishment, after it had been fined £8,700 in June after services failed to run on time. Joan Aitken, The Traffic Commissioner, however said that she had to ensure that she would serve the public and retain their confidence.